In topic 5.1 we learn that energy flows… but nutrients recycle. We are made of organic molecules – nutrients. So why not truly go green? Watch the TED talk below and think about how many connections across the course we can make so far. For more on how saprotrophs such as fungi can be harnessed to solve pollutant problems, check out Paul Stamet’s talk: 6 ways mushrooms can save the world. In other grisly news, a UK taxi-driver has donated his body to science – to become a mummy (in the ancient Egyptian sense). 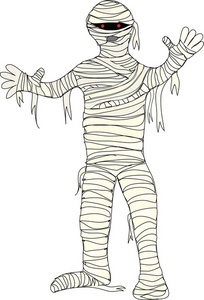 Mummy image courtesy of halloweenclipart.com. Posted on October 31, 2011, in Environments, Human Ingenuity, IBDP Biology, TED talks and tagged fungi, saprotrophs. Bookmark the permalink. Leave a comment.